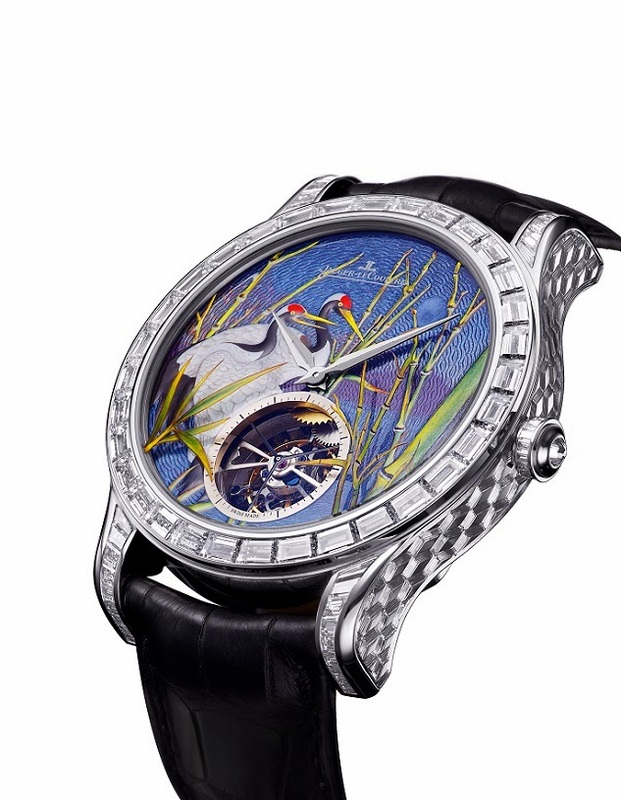 Jaeger-LeCoultre presents a timepiece featuring a sapphire crystal enhanced by a miniature painting applied using an innovative technique for the first time. Cranes, an age-old symbol of longevity, adorn the dial and are surrounded by bamboos of which some are meticulously painted on the sapphire crystal of the Master Grand Tourbillon Enamel watch. The decorated watch glass thus echoes the enamelled dial, creating an extraordinary overall effect of depth and volume. In the heart of the watch beats Calibre 978, one of the 1,242 calibres developed and produced by Jaeger-LeCoultre throughout ilts illustrious history. This caliber is legendary as it has won the memorable first prize in the 2009 International Timing Competition organised by the Watch Museum of Le Locle, Switzerland, and its technical characteristics epitomise the results of Jaeger-LeCoultre’s ongoing research. The tourbillon carriage made from a light yet robust titanium alloy weighs just 0.28 grams, thus very little energy is required to maintain its rotations. The energy from the barrel can therefore be entirely used to keep the large-sized variable-inertia balance oscillating at a frequency of 28,800 vibrations per hour, guaranteeing an exceptional degree of precision. In keeping with fine watchmaking traditions, the parts of this calibre are meticulously decorated by hand, including the oscillating weight in 22-carat gold, seen through the sapphire caseback of the watch. The white gold case is embellished with an engraving on the sides and the bezel is set with baguette-cut diamonds that provide a perfect frame for the miniature artwork depicting cranes. No longer officially taught in art schools, the art of enameling is mastered by an exclusive circle of artisans perpetuating their know-how from one generation to the next. A meticulous guilloché work is performed on the white gold dial that is subsequently covered with transparent enamel with a shade of blue. The artist then draws a multi-colored landscape and places the glittering Moon made of silver foil. Having fired the piece in the kiln to fix the colors, the enameller works with the blanc de Limoges, applying various layers to shape the birds with a relief effect. The artisan will then give a touch of color to a range of miniature elements such as the plumage of the birds and the curve of their neck. The splash of colors gives life to the embossed design. Aiming at achieving a greater depth effect, the artisan adds miniature design elements to the sapphire glass that covers the dial and fires the glass to fix the colors. Finally, such extraordinary enameling is matched by an exceptional gem-setting. Within the workshops of the Manufacture, gem-setting is a discipline exercised as an art in its own right. Not only do they master all the customary gestures involved in their craft, but the Jaeger- LeCoultre gem-setters have themselves developed procedures in order to meet specific aesthetic demands. The gem-setter places the 94 baguette-cut diamonds one by one, side by side, skillfully matching differently proportioned stones in order to cover the white gold bezel, lugs and crown of the watch with a precious glowing aura. The buckle of the watch is then set with baguette diamonds as a final sparkling touch. This timepiece brilliantly combines the traditional know-how of the Manufacture Jaeger-LeCoultre dedicated to the quest for precision since its founding in 1833, and a spirit of innovation illustrated by the development of avant-garde technical solutions.